So my parents had just dropped us off at the Greyhound Bus station in Temple and we had about a 1/2 hour before the bus is suppose to leave. The bus wasn’t even actually there yet, but it arrived in about 20 minutes and we ended up leaving right on schedule. I took that as a good sign. One of these days I’m going to be right on such things, but not today. If you thought our adventure of traveling to Texas was interesting, then you are probably going to think that this return trip is fantastic. I’m actually pretty proud of myself for coming up with some of these solutions on such short notice and am so glad that Lita has enough confidence in me to just let me do what I think is best for us to get where we are going. The whole trip had drama, but all I can do is start at the beginning. So from Temple the bus heads north, stopping in Waco and Fort Worth, before heading west to El Paso. The trip in Texas was not too bad except for Lita asking are few times, “Are we still in Texas”? Going even from central Texas to California you spend most of your time in Texas. I think that Lita knows Texas is big, but she had no idea that it would take so long to travel through. So, so far the trip is pleasant enough. Then we crossed over into New Mexico and the first stop, I think in Las Cruces, we picked up the devil and her slave. From the time they got on the bus, they were trouble. First it was the guy almost picking a fight with one of the other passengers because he was sleeping across the back seat and there was no room for him to sit next to “his woman”. The guy did move to a different seat after a few words were exchanged. All was quiet for awhile, but about 1/2 hour later, all Hell broke loose. Those 2 argued and threw the F-word around so much it made the movie Pulp Fiction seem like a fairy tale. She berated him so much and often that I know that if it was me, I’d be in prison for murder. She started all this crap because it seem that while she was sleeping, he drank all of her soda. He offered to get her another one, but it he didn’t have any money. She was paying for this little trip of theirs. She told him that he needs to sit in the floor like the dog he is, and, I wasn’t looking back, but I’m told that he actually did it. I guess the bus driver either can’t hear what’s going on or he is just ignoring it. Finally after about 30 minutes of this hell, a lady seating in front of me, told them that they need to stop cussing or she would report them to the driver and have them kicked off the bus. I know that the bus would have erupted in applause if they would have been kicked off. This lady said that she saw him take out some drugs and that they shared that between them. He came up with the lame excuse that it was some of his prescribed medication. Duh! If it’s his prescribed medication, then why is she taking it also. Before we left El Paso we had a driver change. The new driver stated before we left not to speak to him while the bus was in motion, plus there is a sign up front that says the same thing. I can understand that because of safety issues, but there has to be some exceptions. So this ‘devil’ cusses at the lady and this lady yells out, “Bus driver will you tell these people to stop cussing back here”. The driver did nothing, but it did calm down the 2 hell dwellers. I was hoping that would be the last of it, but I was wrong again. Thankfully though the rest of their shenanigans were after they got off the bus in Tucson Arizona. 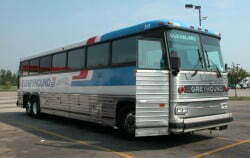 It seems that they were on their way to Yuma Arizona and had to change buses there. I can sure tell you I was glad to here they were getting off. She cussed at him the whole time while departing the bus. She told him that she was through with him and that she was leaving. They got off the bus together and argued in the parking lot area. She even hit him a couple of times. A security guard came by and told them to leave. They walked a few feet away and started up again. This time the security guard got on his radio and I think he was calling the police. She finally flipped him off then left, alone, but about a minute later he went sulking in the same direction that she went. I remember thinking how can someone end up being so whipped as this guy seemed to be. Anyway, there were gone and all was quiet again on the bus. So we have a bus change in Phoenix Arizona with about a 1 1/2 hour wait between buses. While we were there, I’ll be danged if those two didn’t show up again, together. I did my utmost to ignore them, but had to take a peek every now and then. I didn’t see anymore fighting though. I was praying that they did not get on the bus that we were waiting for. I do know that when they made an announcement that they would have some drug dogs walking through the terminal, they disappeared. Actually that was the last I seen of them and didn’t miss them at all. So finally we make it all the way through Arizona and arrive in California. There sure is a lot of ‘nothing’ in Arizona and western New Mexico. People seem to thing that Texas is a land full of sagebrush. Although west Texas is rather flat and non-developed, they need to travel through New Mexico and Arizona to find out what real flat lands look like. We rode for hours and show very few houses and in some stretches, none at all. Now we are in California, Los Angeles, and making our final bus change. Only problem is we are about 3 1/2 hours behind schedule, so we missed all but 1 bus that is leaving for Sacramento that night. We were suppose to arrive in LA at 9:55pm, but finally rolled in about 0115. There was only 1 bus left going to Sacramento that evening, leaving at 0145, and It is what I call a “milk run bus” because it stops in many small towns before it arrives in Sacramento. The trip from Los Angeles to Sacramento is going to take 10 hours. Holy Crap! It didn’t take that long to get through the whole states of New Mexico or Arizona. Well there is no way that we want to send money for a hotel or spend the night in the bus terminal, so we decided to get on the bus. I lost count of how many places we stopped, but it wasn’t as many as I figured it would be. There were only 6 or 7 of them. The towns were so far apart though, that it ended up taking the full 10 hours to get there, even 5 minutes more. So finally we make it to Sacramento at 11:50. I’ve already got a plan in place once we get to here and it should be smoothing traveling from here. Of course if that was the case, this little adventure of ours wouldn’t be near as exciting. As you may have figured out, Lita and I will not be taking a bus cross country ever again, unless there is absolutely no other choice, and I doubt that will ever happen. Interesting Knowledge: Maricopa County in Arizona boasts the most golf courses in the country, with a reported 168, followed by Palm Beach County in Florida with 150 and Riverside County in California with 145. South Park debuts on Comedy Central. U.S. President Reagan assumes responsibility for his role in the Iran-Contra scandal. The German Democratic Republic closes the border between the eastern and western sectors of Berlin, to thwart its inhabitants’ attempts to escape to the West. Walt Disney’s fifth animated feature, Bambi, premiers. The Luftwaffe launches a series of attacks on British fighter bases and radar installations. The Japanese attack Shanghai, China. First major sea-going ship arrives at Gdynia, newly constructed Polish seaport. Polish-Soviet War: Battle of Warsaw begins, lasts till August 25. The Red Army is defeated. Women enlist in the United States Marine Corps for the first time. Opha Mae Johnson is the first woman to enlist. Invention of stainless steel by Harry Brearley. Norway holds referendum in favour of dissolving the union with Sweden. English and Austrians victorious over French and Bavarians. Michael Servetus arrested by John Calvin in Geneva as a heretic. Buddhist monks from Kyoto’s Enryaku Temple set fire to 21 Nichiren temples throughout Kyoto in the Tenbun Hokke Disturbance. (Traditional Japanese date: July 27, 1536). Treaty of Noyon between France and Spain signed. In it, Francis recognizes Charles’s claim to Naples, and Charles recognizes Francis’s claim to Milan. Henry V of England lands at Chef-en-Caux, France with 8000 men. Aradia de Toscano, according to legend/folklore, is initiated into a Dianic witchcraft cult, subsequently founds the tradition of Stregheria later known as the Malandanti. Louis X of France marries Clemence d’Anjou. John succeeds Hormisdas as Pope. 156 Congolese Tutsi refugees massacred at the Gatumba refugee camp, in Burundi. 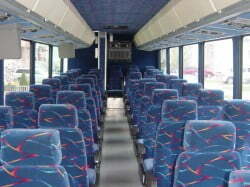 How does Amtrak rates compare with the bus? Or is there Amtrak service in TX? We’re having 90 deg F weather in British Columbia. Just dandy. But had the wettest June and first half of July. What’s it currently doing in Calbayog? That’s exactly the way I thought about it Winda. It was an unforgettable learning experience. They may have a Greyhound Express, but they didn’t have one going to where I wanted to go. Oh we have Amtrak service in Texas alright, but when I checked the prices online, they were really high. I’ll have more on that Amtrak in the next post though, so be sure to not miss it. The weather here is now around 80 def F as it is most of the time. We did get a couple of short rain showers yesterday, but all is sunny now. My experience is that Amtrak isn’t much better than the bus time-wise and costs more than flying. The amenities are a little better but still not so impressive to make me choose them over flying though. You could be right Mark. I just found an AA flight from Killeen (Ft Hood area) to Sacramento for only $159 (versus the $194 for Amtrak). You have to plan ahead though. I get tired of flying sometimes, so if the price is not much different and I’m not in a hurry, Amtrak could be a nice alternative. Hi John i bet your glad to be back home.That bus ride sounds just like the ones in the Philippines,my god i have seen them stop every couple of blocks sometimes.And then they drive like they are at the Indy 500. Did you miss the flooding in manila. I’m glad I didn’t have to worry about the stopping every few blocks or the Indy 500 thing on top of everything else. I guess I did miss the flooding because it wasn’t even raining when we went to the airport and had no trouble whatsoever getting there. I took Greyhound once, never again for the very same reasons as you. It took 21 hours to go from Cleveland to Boston with constant stops and strange companions, lol. I quit riding buses long ago, but I thought I’d give it another chance. This was my first really long distance ride and it was a bad experience, as you read. It won’t be happening again unless I have no other choice. Lita feels the same way too.